Elmer? What is an Elmer? Contained within the service of amateur radio (HAM radio), there is an unofficial group of people that help would-be hams to amateur radio. Members of this unofficial group are sometimes called “Elmers”. This help usually comes in the form of teaching or tutoring the would-be HAM (a.k.a. potential amateur radio operator) although this is not the only function that an “Elmer” might do. Sometimes “Elmers” help the new comer to understand the rules, taking the test to get their first license, sometimes as an advisor to the hobby. 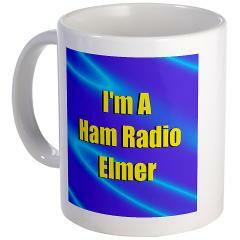 But most importantly an “Elmer” is a friend in the world of amateur radio. One important thing to keep in mind is that “Elmers” are learning too, and sometimes the “Elmer” has an “Elmer” that they go to. In short, almost everyone that is a HAM (amateur radio operator) is an “Elmer”, because we are all friends and we help each other.